Bill Dietz is working between sites: 1) the field of images and rhetoric produced by fitness and athletic companies about the space that the body moves through, 2) the field of images and rhetoric produced by construction and development companies about the space of the city, 3) actual construction sites on the Lower East Side in Manhattan, and 4) historic utopian building projects such as Moishe Ginzburg’s Narkomfin building. 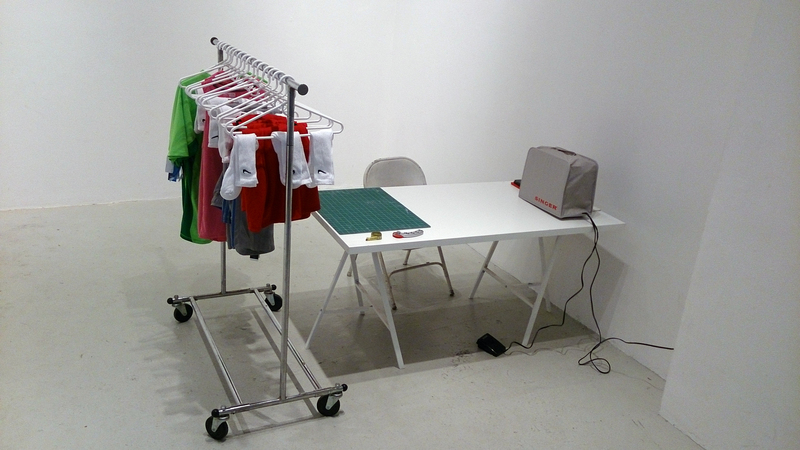 Dietz will spend several days in the gallery sewing rulers out of brand-name athletic wear (Nike socks, Adidas ladies’ tanks, Russell Athletics mens’ running trunks). These rulers index one utopian building project located elsewhere, an example of which is a Shaker building complex in upstate New York. A small, electronic sound box will accompany each ruler–a sonic translation of the same measurement. The audience is invited to these rehearsals, but also to a a series of more formal measuring excursions on Sunday, May 24th at 1pm, 2pm, 4pm, and 5pm. All walks will leave from the Cuchifritos Gallery located inside the Essex Street Market on the south side. Essex Crossing Pedometer is the fourth installment of Threshing Floors, on view through May 31, 2015.